Sarah Misselbrook was born in Southampton in 1977 and studied art at Portsmouth College of Art and Design, and Nottingham Trent University. She recently exhibited at the Beatrice Royal Gallery in Eastleigh, and took part in the ‘3 artist’ weekend run in conjunction with Southampton Saab. Sarah is an artist with talent, ambition and a sense of purpose. Her ‘Feast Your Eyes’ exhibition at Eastleigh was the culmination of four years’ exploration into concerns such as feminism, femininity, the body and consumption. You might gather, she is not your usual, everyday, pretty picture painter. 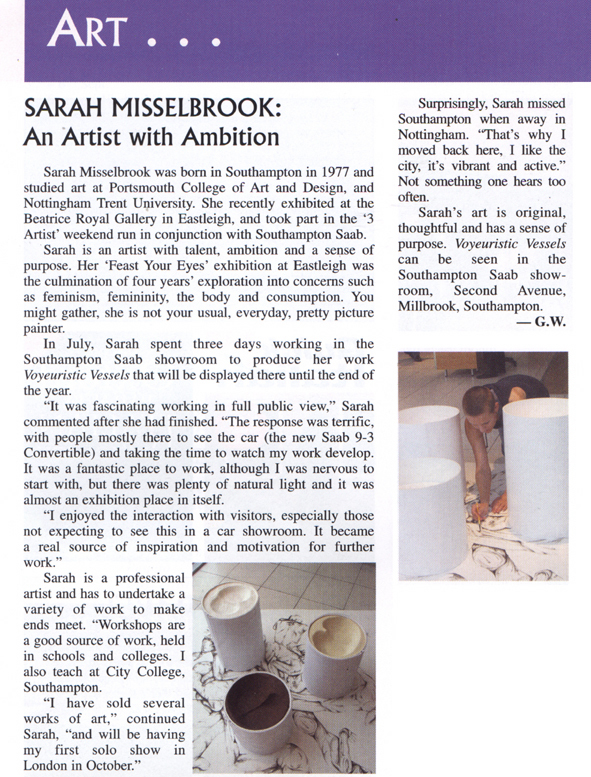 In July, Sarah spent three days working in the Southampton Saab showroom to produce her work Voyeuristic Vessels that will be displayed there until the end of the year. ‘It was fascinating working in full public view,’ Sarah commented after she had finished. ‘The response was terrific, with people mostly there to see the car (the new Saab 9-3 Convertible) and taking the time to watch my work develop. It was a fantastic place to work, although I was nervous to start with, but there was plenty of natural light and it was almost an exhibition place in itself. Surprisingly, Sarah missed Southampton when away in Nottingham. ‘That’s why I moved back here, I like the city, it’s vibrant and active.’ Not something one hears too often. Sarah’s art is original, thoughtful and has a sense of purpose. Voyeuristic Vessels can se seen in the Southampton Saab showroom, Second Avenue, Millbrook, Southampton.